This is a repost from last year. One this rainy day this seemed like just that activity to try again. This time it was much more fun for my now 5-year-old and 2-year-old. What a simple activity on a rainy day. We had so much fun making table bubbles. Not only did my 4-year-old have a blast but my 17-year-old nephew and husband played for at least an hour. My 18 old month son didn’t care for it so much, as it was hard to blow the bubbles. But he was more than willing to pop them as you blew them. I mixed the water and dish soap in a bowl with my dish rag. You then wet the table with the dish rag, make sure you cover any area you are going to blow bubbles on with soapy water. Next dip the end of the straw into the soapy bowl of water. Using the soapy end of the straw place it on the wet table and blow away. We were able to blow some huge bubbles. Next thing you knew my daughter figured out that if you blew a bubble and dipped your straw again, you could go back inside the bubble without it popping. Have fun and don’t put the wrong end of the straw in your mouth! Posted in Children, Crafts/Pojects and tagged bored kids, bubbles, children, Home, kids, projects, rainy day, table, what to do. Bookmark the permalink. With all that Halloween candy to use up we came up with some fun surprise brownies. The kids had a blast adding in the candy bars. It was even more fun to see what kind of candy bar you ended up with in your piece of brownie. Tasty treat with a scoop of ice cream. Don’t forget how important it is to get kids interested and in the kitchen. They learn how to cook and be independent. It is a memory they will never forget. Recipes and baking are a great way to learn fractions and math. Foodies are born in the kitchen, I grew up always helping in the kitchen and so will my kids. Prepare a 9×13″ baking dish by lightly greasing. Pour 2/3 of the batter into the baking dish. Follow by pressing different candy bar pieces into the brownie mix. The kids love this part so get some helpers. 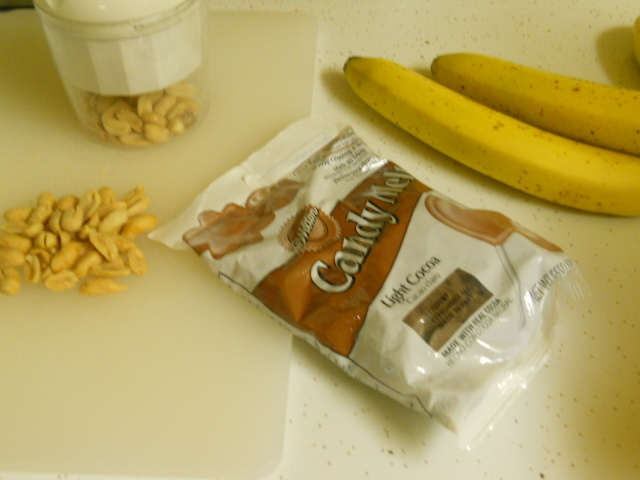 Pour the remaining batter even over the candy bars being sure to at least cover each candy. Spread with a spatula if needed to cover all bars. Bake as directed on box or recipe. Cool completely and serve everyone their very own surprise brownie. You can serve them warm with ice cream as well, but the candy is extra gooey. Posted in Children, Crafts/Pojects, Desserts, Recipes and tagged Bake, brownies, candy, candy bars, Chocolate, COOK, Cooking, fun, Halloween, kids, Recipe, surprise brownies. Bookmark the permalink. As a child I loved to make these funny face toasted cheese sandwiches. They are often forgotten in my house until the mood strikes me. My kids were so pleased to not only make their own dinner but to play with their food as well. We arrived home late last night to no dinner plans. I offered the idea of tomato soup and grilled cheese sandwiches. This led me to the idea of Funny Face Toasted Cheese Sandwiches. We had everything and most people do. Even not making a face this is a tasty sandwich. I’m not sure if it is tasty because this is a comfort food or actually good. The possibilities are endless with these sandwiches. As a child it was always an onion smile, olive eyes, and thinly sliced dill pickle nose. We worked with what we had and to each person’s taste. Place a slice of bread on a baking sheet. Spread about 1 Tbs of ketchup per piece of bread. Sprinkle with Italian seasoning or Mrs.Dash if desired. Top with sliced cheese and decorate with vegetables. Broil sandwiches until cheese is melted and hot. Great served just as a sandwich or with tomato soup. Posted in Children, Crafts/Pojects, Recipes, Sandwiches/Burgers and tagged bread and butter pickles, Cheese, colby jack cheese, dill pickles, ketchup, kids, kids cooking, mrs.dash, olives, Pizza, quick dinner, quick lunch, Sandwiches, toasted cheese sandwiches, tomato soup. Bookmark the permalink. When my daughter moved from a car seat to a booster seat she was happy but soon realized that it wasn’t cracked up to be all she thought. She no longer takes naps and only will fall asleep in the car. The side of her car seat was where she leaned her head to sleep. After trying many different style neck pillows but nothing seemed to work, and she was one unhappy camper when she woke up with a sore neck. This car pillow seems to work better than any I have bought. I then came across Seat Belt Travel Pillow-Pineapple Mama, with instructions to sew my own car pillow. I am not one to sew, and was lucky that it was on a basic level. Personally I think my pillow turned out pretty good for my skill level. I need to pass this link and idea on to anyone with a similar problem. The pillow really worked for us and cost little to make. Thank you Pineapple Mama. Posted in Children, Crafts/Pojects and tagged Car seat, Child safety seat, children, craft, Infant car seat, Pillow, project, Seat belt, sewing, Shopping, Vehicle. Bookmark the permalink. Imagine a rainy day in Washington State, I know hard right! Well to keep the kids entertained we cut up some egg cartons and painted them into caterpillars. Add some pipe cleaner legs, antennas, and some googly eyes. As you can we had a variety of ages and ideas working away. 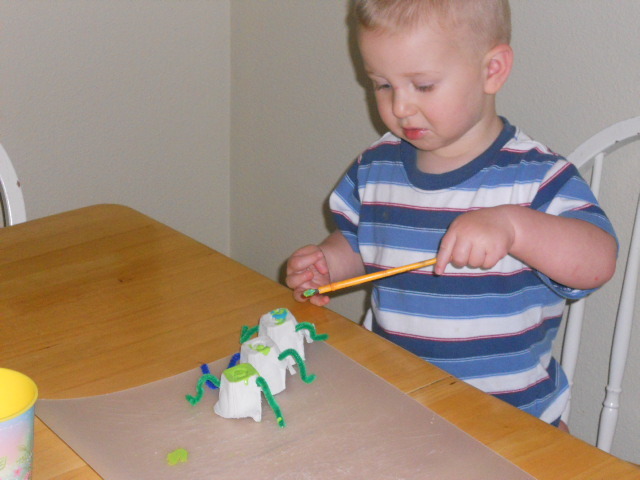 Enjoy another rainy day activity to help keep the kids busy and you from going crazy! 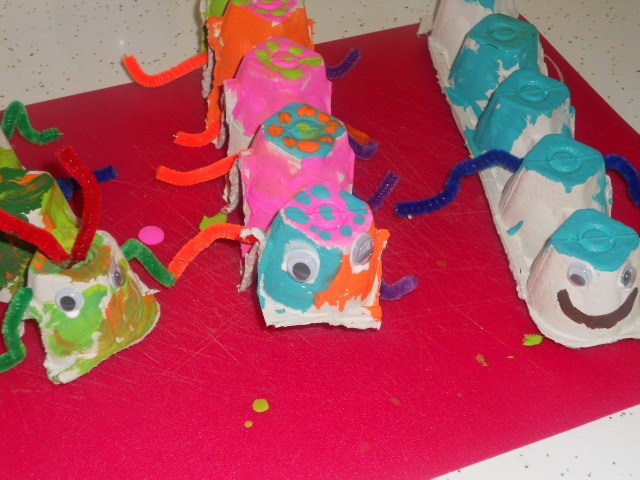 Posted in Children, Crafts/Pojects and tagged Business and Economy, caterpillars, Ciara, crafts, Easter egg, Egg carton, Flickr, Paint, Pipe cleaner, projects, United States, Washington. Bookmark the permalink. This is an easy summer treat. Cool and at least a little better for you than ice cream. Plus two little banana bites would fix a sweet tooth. I know I like bananas but believe most people who don’t would like this treat. My daughter had a blast topping the bananas as I dipped them, so get the kids in the kitchen and have some fun! Prepare a sheet pan with wax or parchment paper, and clear a space in the freezer large enough to fit the sheet pan. Slice bananas in thick slices. Prepare toppings by crushing or chopping, and set aside in bowls. 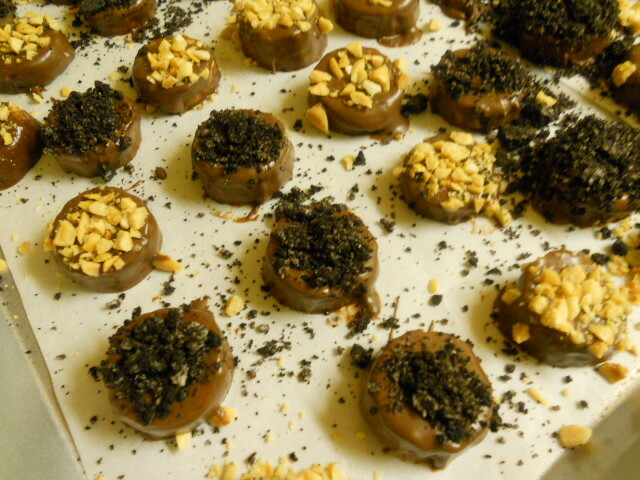 Melt chocolate and 1 Tbs of shortening, using a double boiler method or method of melting choice. Dip bananas in chocolate (I think laying banana slices on a fork worked the best), set on a cookie sheet and sprinkle with toppings. If chocolate becomes to thick or starts to seize because of the moisture of bananas add a Tablespoon of shortening at a time stirring until smooth. Continue until all bananas are covered and on the cookie sheet. Place cookie sheet in freezer for about two hours. Then transfer banana bites to freezer bags and store in freezer, until you have eaten them all. Posted in Children, Crafts/Pojects, Desserts, Recipes and tagged Arrested Development, Banana, Chocolate, Coconut, COOK, cookies, Frozen banana, Ice cream, peanuts, Sheet pan, Tablespoon. Bookmark the permalink. “Did you say we can play in pudding”, asks my five-year-old. This activity is more geared for young toddlers who wouldn’t know any better than to get paint in their mouths. Turns out my tidy toddler wanted nothing to do with this but the 3 and 5-year-old ended up covered head to toe. I prepared as directed a few packages of instant pudding, and placed them in shallow pans. Put out some spreading tools such as paint brushes, cotton swabs, and popsicle sticks. In the end the girls were so covered they just finger painted. The kids either got down to unders or had a swimsuit on, and let them play. 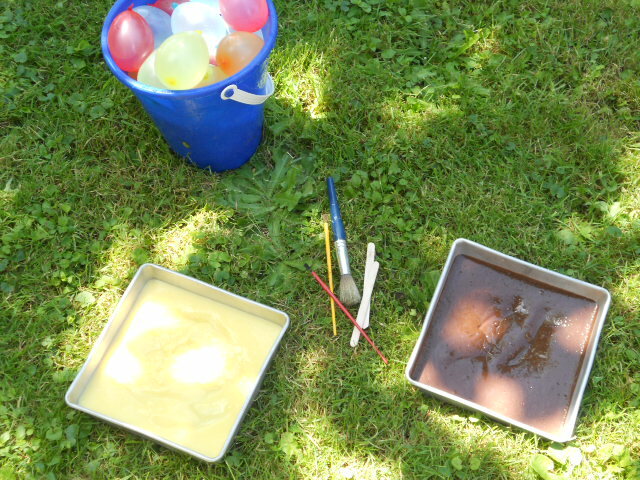 While it was warm outside than they were all ready dirty we had a water balloon fight after the pudding fun. I got a warm bucket of water and a wash cloth to get most of it off before coming inside for a bath. Posted in Children, Crafts/Pojects and tagged activities, Banana, Banana pudding, Business, Cream, Dessert, finger painting, Paint, projects, Pudding, summer fun, toddlers, Whipped cream. Bookmark the permalink.